Ryde City Mayor Clr Ivan Petch and Brush Farm Historical Society President Beverley McClymont officially re-open the house. Brush Farm House - the country home built by explorer Gregory Blaxland - was officially reopened on Friday after a 12 month $3.3 million restoration. Built in 1820 the house, one of Australia's oldest country homes, is listed on the NSW Government's State Heritage Register, as well as the National Trust. 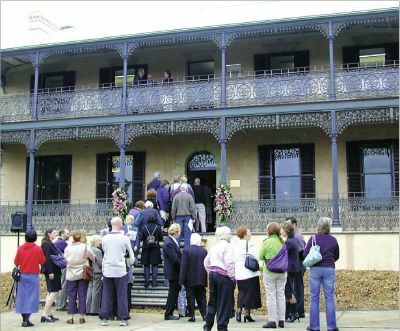 After officially opening the premises, Ryde City Mayor Clr Ivan Petch said: "The City of Ryde has realised a long-held dream to see Brush Farm House brought back to life. It is now restored to its former glory for the whole community to enjoy." "Brush Farm House provides a rare and tangible link with our early heritage. It takes visitors back to a time when the Ryde district, as only the third area of European settlement in the fledgling colony, was vital to the establishment and growth of our nation's agriculture, cattle and wine industries." 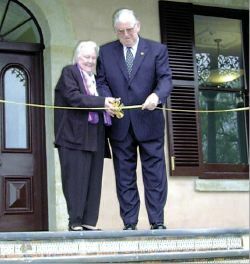 Mayor Petch relayed a message from Prime Minister John Howard who had shown great interest in the project, but was unable to attend: "Heritage is vital to our community and the restoration of Brush Farm House is a demonstration of what can be achieved when all levels of government work together to preserve the best of our past." Funding for the restoration came from the City of Ryde, the State Government through NSW Heritage, and the Federal Government. Deputy Premier and Ryde MP John Watkins also invested a great deal of effort into the cause. The works included careful preservation of parts of the building including original stonework and brickwork, and painted cedar joinery doors and windows. Original paint colours were also matched, and recycled hardwoods from Kempsey were used to repair the floor and roof structure. The two-storey verandah was rebuilt, and the fireplaces were repaired and given new hearth tiles. The building will continue to reflect its history, with each of the rooms named after historically significant figures including Blaxland, Forster and Carpenter. Blaxland arrived in New South Wales with his family in 1806. He soon took up land at Eastwood, which was later known as 'Brush Farm'. He is best known for crossing the Blue Mountains with fellow explorers Wentworth and Lawson, and pioneering the cattle industry. Mayor Petch said: "After years of neglect rendered the house a sad reflection of its former life, this sympathetic restoration by Council, is set to open up a new phase in the colourful and long history of Brush Farm House." It's been a long wait... public queue up to catch a glimpse of the refurbishments inside the 'new' Brush Farm House.